Helen and I had new tyres fitted over the weekend. We had booked it far in advance to make sure we could get the tyres we wanted in time. 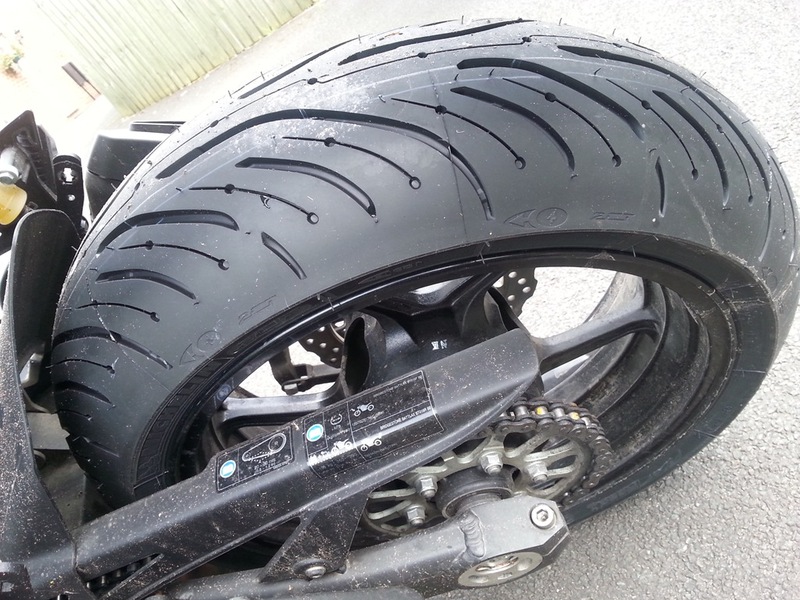 We had ordered Michelin Pilot Road 3 tyres but he was unable to get a rear for my BMW as it has an odd size 190/55/17. So in the end we both opted to have the new Michelin Pilot Road 4 tyre fitted instead. 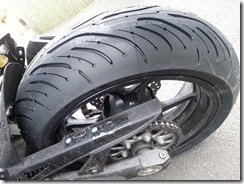 They are slightly harder in the middle but the softer compound is much nearer the middle than on previous tyres. They have also reduced the amount of tread pattern near the edge of the tyre to give a larger rubber contact area for more grip. They have assumed that most people will not be using big lean angles in the wet. Unfortunately on Saturday the weather was awful with heavy downpours and thunder and lighting. We didn't really have much choice other than to go for the tyres. We only had to go round on the motorway so didn't expect too many problems. We had to filter for a bit around the Trafford Centre but otherwise it was ok and by the time we got to the tyre place the rain had stopped. While the tyres were being fitted we had a quick look in Ducati Manchester and had a coffee at a local cafe. The visit to Ducati confirmed to Helen that the Multistrada is to tall for her to feel comfortable with. We had a little bonus when we came to pay as we found out Michelin are currently offering £25 cashback on a set of tyres. The offer runs through to the end of July, so if your after a set of tyres you might want to get them soon. As we left Sale and headed for our next stop in Atherton it started to rain heavily again. We were heading over to Kais Performance to have Helen’s suspension setup as she felt it wasn’t setup correctly for her. Again we had to filter past the Trafford Centre but we weren’t held up too badly. We arrived at Kais Performance and they promptly set about sorting it out, he said that it was setup too soft and was possibly hitting the bump stop. He also said the damping at the shock was pretty much set at its limit as the factory shock isn’t great, this I was already aware of. He also advised that with the luggage on the rear would probably drop about 10mm which would equate to 2 turns on the preload at the rear shock (We bought a nice Ohlins C-Spanner for the job). After that we headed back home in the rain again and had to filter for a while at the end of the M61 as more people were trying to get to the Trafford Centre. The weather had picked up by Sunday so we decided to give the bikes a quick round around the Moors to give the tyres a scrubbing in cycle for our upcoming tour. The tyres felt pretty similar to the previous Road 3s we have had. They performed excellently in the wet yesterday and they seemed fine in the dry as well. Nice turn in and seemed to have plenty of grip only time will tell but first impressions are positive. They are also supposed to last longer as well, my bike was on 11,600 miles and Helen’s was on 1600 miles when they were fitted. The general problem with have with tyres though is that we usually have to change a set of part worn tyres as we are never sure if they will last for our upcoming tour. Which is exactly what happened last year to Helen’s rear tyre on the abrasive asphalt in the Vosges.